Judas forgot just one thing, and that one thing was the difference between life and death. Judas forgot that he was only one in a long, line of failed faithful. So many in Scripture committed grievous acts of betrayal against God. But each one found their way back to God's side through the back door of grace. Because he forgot to try the door. Judas did not want a gift of grace. 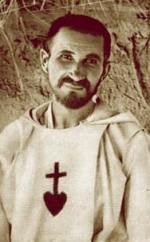 "True wealth, true glory, true joy is to be found in the cross. Happiness is necessarily linked with the cross since Jesus Christ declared this truth. But we look upon such truths as impenetrable mysteries. we would find it lovable and worthy of our embrace." Hosanna! Blessed is the King! Saint Andrew of Crete, was Archbishop of Crete at the end of the 7th century and the beginning of the 8th. He was a theologian, teacher and hymnographer. 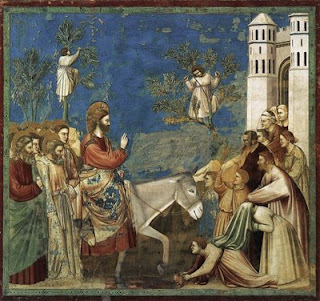 Below is his sermon for Palm Sunday. So let us spread before his feet, not garments or soulless olive branches, which delight the eye for a few hours and then wither, but ourselves, clothed in his grace, or rather, clothed completely in him. We who have been baptized into Christ must ourselves be the garments that we spread before him. Now that the crimson stains of our sins have been washed away in the saving waters of baptism and we have become white as pure wool, let us present the conqueror of death, not with mere branches of palms but with the real rewards of his victory. 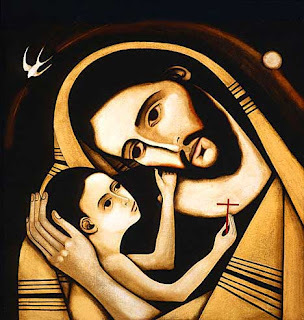 Let our souls take the place of the welcoming branches as we join today in the childrens' holy song: Blessed is he who comes in the name of the Lord. Blessed is the king of Israel." Before we started our visit we gathered together for in the Country Kitchen. Above the 15 years olds meet the 103 year old. A joyful and thankful Geraldine received many gentlemen callers on the eve of her 83rd birthday. 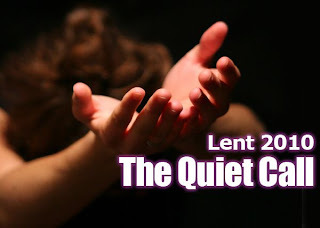 For me, Lent seems to be the time of the year when I best become “spiritually cleansed.” This is for a lot of reasons, but mostly due to the atmosphere created in the Catholic Church during this time of year. 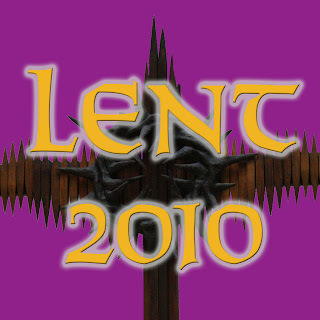 What is most incredible and so dynamic about Lent is what the Church calls us to focus on: the sacrament of confession, fasting/abstaining, and the Crucifixion. But why all of a sudden must we focus on these specific things? Shouldn’t we be focusing on these aspects throughout the year? There is no greater love than that which God has given us, the redemption of mankind through the sacrificing of His only Son. The Church is calling us to take a closer look at this love. I was trying to figure this seemingly theological “love” thing out recently, especially the love that God has for us. I don’t know about you, but sometimes it’s tough to feel the love. We are told it’s there, but I can’t always get it, ya know? Connect these lyrics with the Lenten message of the Love of Christ in His sufferings, and we can sort of understand the meaning of love, and even the idea of suffering as well. Through every cross, little or big, we are united in Christ’s sufferings. Also during Lent, we are reminded that Christ did not carry His cross by Himself. What ever is going on in our lives during this Lenten season, know one thing — God loves us and is right next to us, helping us out with that cross of ours. DANIEL McQUILLAN is a senior at Kellenberg Memorial High School, Uniondale. The question may strike you as irreverent. How dare I suggest that the Blessed Virgin Mary, Queen of Heaven, Co-Redemptrix of mankind, could have left us in the lurch like that? This sentimental view is dangerous too. If we believe that the most important decision in the history of the world was in fact inevitable, that it couldn’t have been otherwise, then that means it was effortless. Now we have a marvelous excuse for laziness. Next time we’re faced with a tough moral decision, we needn’t worry about doing what is right. Just drift, and God will make sure that whatever choice we make is the right one. If God really wants us to do something he’ll sweep us off his feet the way he did Mary, and if he chooses not to, it’s hardly our fault, is it? The Scribes and Pharisees brought this woman to Jesus. 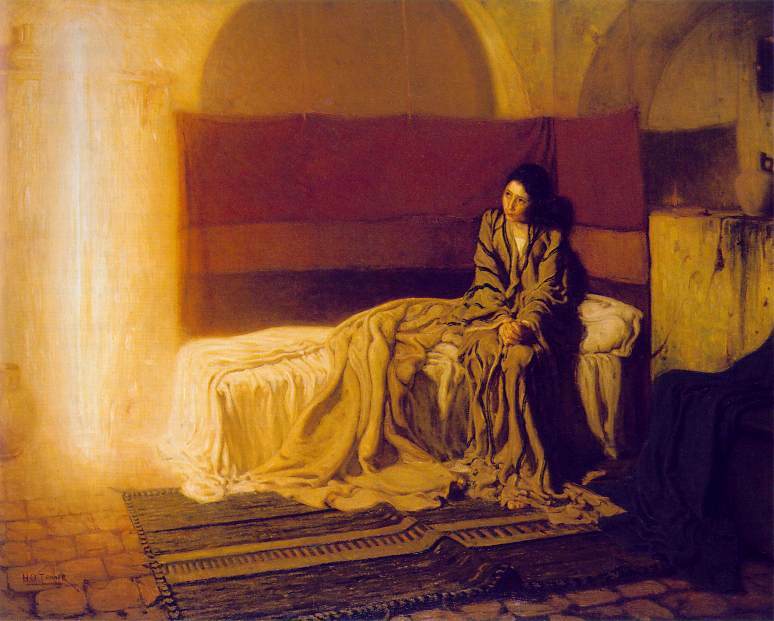 Just imagine how this woman felt when brought before Jesus. I’m sure she felt complete and utter shame. Terrified because the crowd brought her to Jesus for judgment. Her life was in his hands! And Jesus does something that the Scribes and Pharisees could have never predicted. He is reminding them, that we should never pass judgment on one another. God is to judge, not us. They knew what He was saying was true. Jesus was left alone there with this woman. A great act of charity given to her, forgiveness. For now was simply scribbling in the sand. A couple of years ago, the Brothers of the Province read a book by Eckhart Tolle during our summer Renewal Program. The Power of Now is the sort of book that continues to swirl about in your consciousness even after you’ve read it. It left me permanently changed. The principle of the book is quite basic — nothing exists outside this present moment. But that’s a very different way of thinking than we are used to. We think of our lives as line segments from birth to death. The present moment was just a single point on the line moving slowly forward. The past was the part of the line behind that point, and the future was the part ahead of it. The Power of Now stopped me from thinking this way. The Power of Now taught me that there is no line segment. The point is all there is. The past and the future are just illusions. They only exist to the degree we focus our attention on them right now. We create the past and the future by imagining them in the present. But we don’t even exist outside the Now. Living in the moment has its graces. Think about living in the moment as you watch this video. 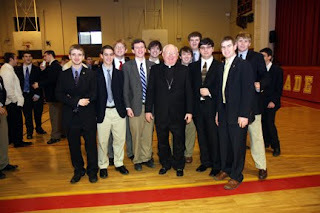 Our Bishop visited with the many students at one of our schools, Chaminade High School. Bishop William Murphy yearly visits all our schools in the Diocese to meet the young people. Every visit is an opportunity for the Bishop to share his joy for the youth of the Church. The young men were very enthusiastic about his visit and shared their faith and what Chaminade means to them in their lives. The Pope goes on to state that we must listen to Jesus’ words and that we must also bear in mind that the Our Father originates in his own praying – the Son’s dialogue with the Father. “This means that it reaches down into depths far beyond the words. It embraces the whole compass of man’s being in all ages." He also quotes German author and poet Reinhold Schneider, who offers an even more arresting insight: "The Our Father begins with a great consolation: we are allowed to say ‘Father’. This one word contains the whole history of redemption. We are allowed to say ‘Father,’ because the Son was our brother and has revealed the Father to us; because, thanks to what Christ has done, we have once more become children of God. 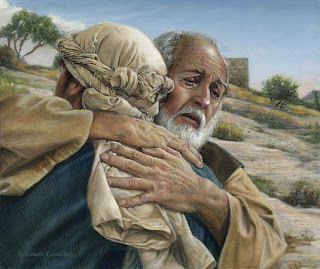 "An invitation to meditate on the parable of the "prodigal son", in which we are reflected in "the two children and especially, in which we contemplate the heart of the Father. Let us cast ourselves into his arms and be regenerated by his merciful love. This chapter of St. Luke, represents a spiritual and literary high point of all time. Indeed, what would our culture, art, and more generally our civilization be without this revelation of God the Father, full of mercy? It never ceases to move us, and every time I hear it or read it, it always suggests new meanings. Above all, this Gospel text has the power to speak of God, let us know his face, better yet, his heart. After Jesus told us of the Father's merciful love, things have changed forever, now we know God, He is our Father who created us free to love and gifted us a consciousness that suffers if we get lost and that celebrates if we return. For this, the relationship with God is built through a story, similar to what happens to every child with their parents: at the beginning he depends on them, then he claims his own autonomy, and finally - if there is a positive development - he comes to a mature relationship based on genuine gratitude and love. Fortunately, God never fails in his loyalty, and even if we move away and get lost, he continues to follow us with his love, forgive our mistakes and speak to our inner consciousness, to call us back to him. In the parable, the two children behave in an opposite way: the younger son leaves and increasingly falls lower and lower, while the older son remains at home, but he also has an immature relationship with the Father, because, when his brother returns, the older son is not happy as the Father is, indeed, he grows angry and refuses to return home. The two sons represent two immature ways of relating with God: rebellion and hypocrisy. Both of these methods are overcome through the experience of mercy. Only by experiencing forgiveness, recognizing ourselves as loved with a free love, greater than our misery, but also of our justice, will we finally enter into a truly filial and free relationship with God." Catholic Youth - Way Cool! Yearly one of our students attended Catholic Familyland and shared stories on her return. Grace Moran is among the many featured on this video. Enjoy! So many of us have failed. And it is in failing, that we succeed. It is in our failing that we learn. We always try to improve ourselves, but internal improvement is the source that will make one beautiful. We have been made in the image and likeness of God - Think about that statement, what do you think it means in respect to God? To us? What does perfection, at least God's eyes, look like? Well, we are racing through Lent and almost half way towards Easter. So, how's your Lent been so far? Have you been faithful to exercises of prayer, fasting and almsgiving? Or did you have a good start and just fizzled out? The "devil in the desert" would like nothing more than for you to give up on Lent. Well, to hell with the devil! Life is about second chances. Start Lent right now! No, don't say it is not worth it! Find 10 minutes a day to sit still and remember that God is present... that's called prayer. Choose some form of comfort (food or Southern? )whose absence for 40 days will create an empty space the Spirit might rush to fill...that's called fasting. 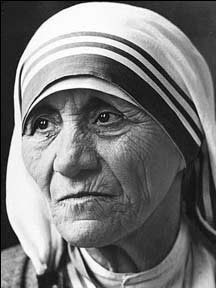 Reach out to the poor on your own or through your a Lenten Program...that's called almsgiving. Find some way to remind yourself daily that you are living in the season of Lent. Sometimes it is as simple as a post-it on your bathroom mirror with the word LENT on it, It doesn't have to be fancy, just keep it simple. In some way, remember to pray, fast and reach out to the poor everyday. Lent is a spiritual spring time wherever you live and it is not too late to plant the seeds of Lent in your life. Sometimes Lent can become such a negative experience. We can place so much emphasis on what we are going to give up for lent. And then when temptations arise we "just say no." But when we say "no" to ourselves, are we saying "yes" to God? God not only says: "You are my Beloved." God also asks: "Do you love me?" and offers us countless chances to say "Yes." That is the spiritual life: the chance to say "Yes" to our inner truth... And at every point of the journey there is the choice to say "Yes" and the choice to say "No." There are countless areas of our lives when we can say "yes" to God. And when we are trying to discern God's will in our lives we say "yes" to God as well. But how many times during our day are we conscious of saying "yes" to God? "You cannot learn humility from books; you learn it by accepting humiliations. Humiliations are not meant to torture us; they are gifts from God. These little humiliations -- if we accept them with joy -- will help us to be holy, to have a meek and humble heart like Jesus." "I’ve never gotten anything from confession with a priest that came close to what I’ve gotten from God. I guess I will never understand desiring all these intermediaries, these layers, these mortal substitutes for the real thing. Once you've tasted the real thing, you don't want anything else—you can't want anything else. Nothing less than God will do. So there’s the question: Why do we need intermediaries? Because in the end we can’t help ourselves. Think about it. This is even what you say sometimes to the priest (or to yourself) when he asks, “Why do you keep falling into this sin? Why do you keep making this mistake?” Because, Father, I can’t help myself. Turning our hearts around, the real meaning of repentance, is a big big job. Every year, the Church gives us a whole 46-day period from Ash Wednesday to Easter to call us back to repentance. That’s a long time, with many prayers and sacraments, including confession, hopefully. We need all the help we can get, seems to be the message. Because here it is Lent again, and the same job of repentance is staring me in the face. Bless me, Father, for I too have sinned." "Confession is a very powerful and sometimes misunderstood sacrament. Many people find it difficult to confess their sins cause they would have to admit they have done something wrong and tell another person about it. This fear is natural because, well, we are human. We don't like to admit we have messed up once or twice. However to admit we have failed allows us to draw closer to Christ when we acknowledge "yes we are sinners and need to be saved." That was the whole purpose of Christ coming to earth, to free us from sin. Now back to confession. I know there is a lot of fear when this comes up. Like I said before it is hard to admit we are wrong. Also, can we remember all our sins. Then the really big part, are we truly sorry. Are we truly sorry, and will we do our best not to sin or at least perform that sin again? 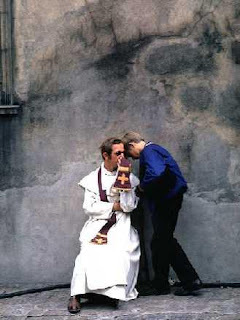 Its seems sometimes there is no reason to go to confession. The media and others can make it seem like a big joke. I have seen several times on television a scene where someone enters the confessional and makes a big joke out of it. Reconciliation is a great gift of God's Mercy. Other people say, "I don't believe if a person just says 'o I am sorry' and puff they are forgiven." True confession is not just words, but sorrow for those sins, making a decision to not sin again, and finally doing you penance. I personally feel confession is a healthy thing to do. Whenever I am going through a rough time or just feel like somethings wrong one of the things I do is go to confession. Now don't worry I am not using confession as a sort of cure all just to talk to someone, sin really can make you feel terrible. 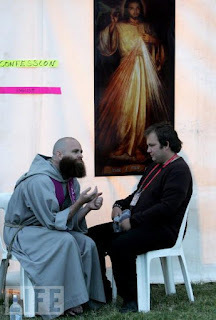 I know ever time I have gone to Confession, it is as though my eyes have been opened to see the world differently. Everything seems right, even for just that small moment. So take the time and go to confession. If it has been a while that's ok. There is always a chance to change and to be forgiven. Experience the Mercy of God, through this wonderful Sacrament. 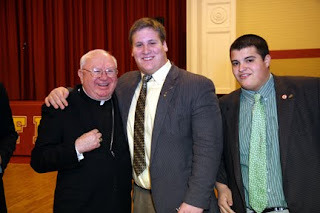 A student of mine sent me something Archbishop Timothy Dolan wrote entitled, "To Whom Shall We Go?" “Lent is the forty days of preparation for Holy Week and Easter. Why do we have it ? To accept in a more intense way the invitation of Jesus to be more closely united with Him on the cross, thereby dying with Him to sin, selfishness, Satan, and eternal death, so to rise with Him on Easter Sunday to a more radiant life of grace, mercy, and spiritual rebirth. How do we do it ? Through the three ancient Lenten practices: prayer, sacrifice, and charity. A newsman asked me if I have any practical counsel for Lent. This sacrament of penance is most associated with this season of Lent. There is no better time to approach this sacrament of reconciliation than before Easter. Last week I made my annual retreat with thirty-five other priests from the archdiocese in Ars, a tiny village in southwestern France.That village had a legendary pastor, or curé — the Curé of Ars – by the name of John Vianney for forty-one years. While there, he converted the town, and, a case can be made, all of France, simply by hearing confessions. By the time of his death in 1859, they had built a new train station to handle the thousands who came weekly to approach the confessional of the humble, holy pastor now venerated as the patron saint of priests. We priests knelt before that simple wooden confessional a lot last week, preparing for our own confession on retreat, and praying, at my request, for a renewal of the sacrament of penance in our own parishes and archdiocese. We’re called to be saints, but we’re sure not there yet. And a great help to get there is the sacrament of penance. And Lent is a grand time to return to it! We all know the desert is a lonely and forsaken place. And the devil chooses the wilderness to come against us, just as he chose to confront Jesus. Things you thought were destroyed come back to attack again. The battle intensifies, often at night when defenses are down and weariness sets in. Yet the wilderness is also the place of spiritual discovery. During Lent we are in the midst of a forty-day battle. The devil is never to be underestimated, nor given an inch. We need to fight all the more when his attacks come. No matter how tired,immediately counterattack with the Name and power of Jesus Christ, who spent forty days in the wilderness and emerged triumphant. Take no prisoners. The devil plays for keeps. We should, too. Our souls are depending upon it. 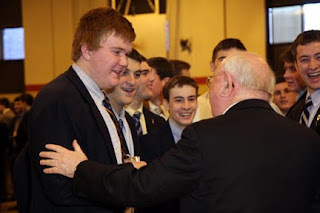 Last evenving we hosted over twenty-five high school young men interested in exploring the Marianist way of life. Operation Fiat was held at the Chaminade-Mineola Marianist Community. Evening Prayer began the night followed by dinner and dessert in the Comunity dining room. Brother Kenneth gave a presentation that described the development of his vocation. From the early days of St. Joseph grammar school he mapped out the signs of a religious vocation. "A vocation is all about relationship." And he responded with a "Yes!" Pray that the grace of a religious vocation may continue to grow in the hearts and minds of those young men last evening. Connect these lyrics with the Lenten message of the Love of Christ in His sufferings, and we can sort of understand the meaning of love, and even the idea of suffering as well. Through every cross, little or big, we are united in Christ’s sufferings. Also during Lent, we are reminded that Christ did not carry His cross by himself. What ever is going on in our lives during this Lenten season know one thing- God loves us and is right next to us, helping us out with that cross of ours. Every Monday we host Adoration of the Blessed Sacrament at each of our high schools. Adoration continues until 5:30 p.m. Truth be told, one of my students told me that he had never been good at adoration. Either his mind wanders aimlessly... or he falls asleep. Not a bad place to sleep in the presence of the Lord. This past year he came with twenty other high school students to a conference in the midwest. And this time he begged God to speak to him in that setting. 250 young men worshipping Christ in the Most Blessed Sacrament. He told me he asked Jesus to show him true happiness. "Please," I begged. "Please, please, please... And Christ spoke to me. And His words were few, but powerful. "Of course!" I thought. But I kind of knew that. He is the source of all joy. For what seemed like 15 minutes, all I could hear in my head were those four words. Find joy in me. Find joy in me. Find joy in me. But as I continued to think... and soon became destracted... the phrase (or at least the emphasis) changed. Soon it was: "Find joy in ME." At each distraction, I was "snapped" back to Christ saying, "Find joy in Me." Not in other people. Not in your friends or your family. Over here! Find joy in ME! Not over there. Find joy in ME. There it was, a true prayer. One that brings focus back to God and not on the distractions of the world. One that holds your gaze, your attention and your spirit. Finally! I had "found" something in adoration. My attendance at Mass was the most amazing I have EVER attended. I heard speakers who pierced my soul. I talked with people who LOVED God. I know that our God is an awesome God, and that He has WONDERFUL things in store for those who love Him. But I know where the source of joy is... was... and always will be. It is my Lord who strengthens me. "Find joy in me." Thank you, Jesus.